You have to come into the store and sit on this, it's the most comfortable lounging chaise! Also available in chocolate brown color. Extremely comfortable sectional from the trusted Simmons company. Round, square, or rectangle; traditional height or taller pub height - we have them all! TV stands, entertainment centers, book cases, plant stands, and coffee table sets. We have everything to accessorize your rooms! Huge selection of mattresses in Twin, Full, Queen, California King and Eastern King Sizes. Pillow-top, non-pillow top, gel memorny foam; along with the hottest new item - BAMBOO mattress. We can even special order extra-long twin mattresses for your college dorm! Call (702) 675-6700 to get all the details on our Trade-In Trade-Up program! Out with the old, in with the NEW! NEW Apartment Package! 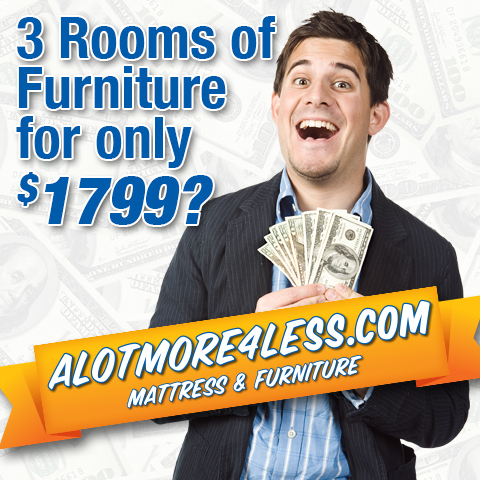 3 rooms of furniture for only $1799! Copyright © 2019 A Lot More 4 Less. All Rights Reserved. Designed by JoomlArt.com. Joomla! is Free Software released under the GNU General Public License.